Ultra-touristy or no, we decided that we had to see the Sydney Aquarium. So we shlepped downtown again, paid our gazillion dollars, steeled our nerves for the onslaught of screaming children and ventured in. Afore-mentioned screaming children and rude tourists aside, I was actually quite happy with what I saw. There were lots of crazy fish and crabs (especially spider crabs…I would not want to see one of those suckers coming at me), but the best part was where you went underwater to see the sharks and huge rays and dugong and sea turtles. 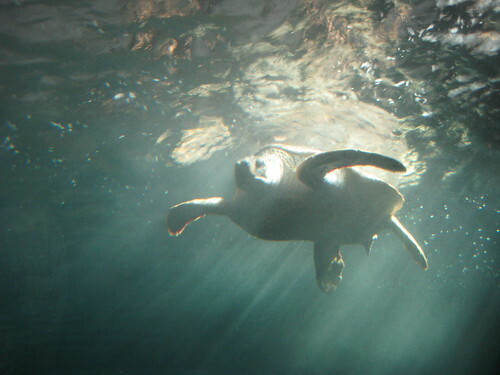 Speaking of sea turtles, one of them was named Floaty. She was cute. Also cute: little kids freaking out every time they saw a fish that looked like Nemo or Dory. We were getting hungry (and, yes, thirsty) by this point so we walked a few minutes to the Redoak boutique beer cafe, and once again were not disappointed. 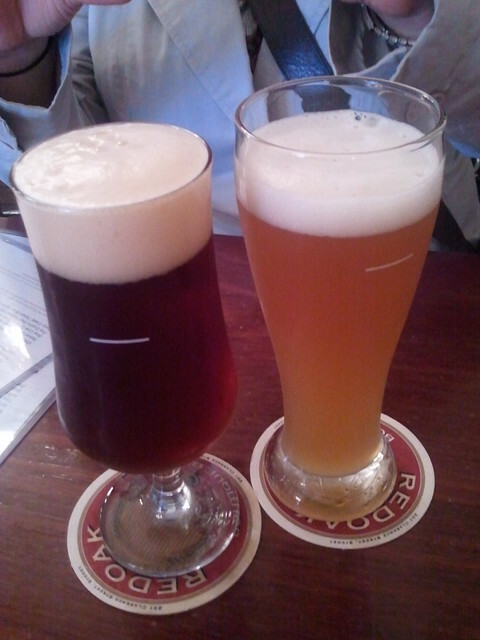 Their wheat beer was one of the best I’ve ever had, and the bock and porter were nice as well. It all went well with the sausage and mash (as did Nellie’s three — Oktoberfest, wheat and organic lager — with her roast beef sandwich) and we left full, once again. We decided to end the day’s adventures there; it was time to head home and get ready for our flight to Perth. We made it to the airport with plenty of time, except that a) a corkscrew had accidentally been packed in my bag (which security was not cool with) and b) they boarded the flight much earlier than most Virgin Blue flights, so we ended up being among the last passengers to board. No matter; we got on, and we were on our way following a seat change due to Nellie’s malfunctioning TV screen. And by ‘malfunctioning’ I mean that it literally fell out of the seat back in front of her when she touched the screen. And so: off to the west coast of Australia, and the delicious wine therein! Once we arrived we picked up our rental car and drove to our hotel, having decided to spend the night in Perth rather than drive to the Margaret River in the dark. There was some minor trouble with the law, and I’ll save my comments about the hotel for Tripadvisor, but we did have a very nice meal next door at a place called Tart. So that helped improve the evening somewhat. Problems with customs and then….I can barely wait to hear about the problem with the law.